Is the Recession In Its Second Year Now? Today, the US government reported that gross domestic product (total output of goods and services) contracted at an annualized rate of 0.3% in Q3 2008. The GDP report showed that consumer spending (about 70% of the US economy) declined 3.1% during the quarter which is the biggest decline since 1980. For some perspective on the US economy, today's chart illustrates the ECRI Coincident Index. This index is a composite of several economic indicators (includes measures of production, employment, income and sales) that provide an indication as to the current state of the US economy. Since 1950, the ECRI Coincident Index has (on average) peaked one month before the beginning of a recession (as measured by the NBER – the official arbiter of recessions) and troughed at the same time that a recession ended. Today's chart illustrates that the ECRI Coincident Index peaked back in September 2007. This suggests that the US economy has been in recession since Q4 2007 and that the recession is ongoing. Courtesy of "Chart of the Day"
Economists now think Q4 2008 GDP growth will be between negative 5% and negative 0.1%. That would make for two consecutive quarters of negative GDP growth, the layman's definition of a recession. More importantly, it would give us negative GDP growth for three of the last five quarters that all showed a decline in jobs growth and plunging ECRI WLI. Lets hope the US Stock market rebound since its recent low is acting as a leading indicator . It may be predicting another stimulus package will come after the election and it could go even higher after the uncertainty over the election is gone next Wednesday and the efforts by the US Treasury and Federal Reserve restore liquidity to the credit markets. 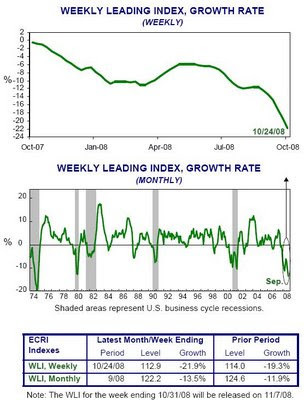 Today ECRI said its WLI fell to 112.9 for the period ending October 24, 2008. Last week WLI was 114.0. The WLI growth rate fell to -21.9%, down from -19.3% last week. "With WLI growth plummeting to the lowest reading registered in its six-decade history, the outlook for the economy has darkened dramatically." Is the Recession two years old now? I explore that idea in my upcoming article "Is the Recession In Its Second Year Now?" The U.S. economy contracted at a 0.3% annualized rate in the third quarter, as consumer spending declined at the fastest pace in 28 years, the Commerce Department estimated Thursday. Final sales to domestic purchasers fell 1.8%, the largest decline in 17 years. Investments in homes fell for the 11th straight quarter. Inflation-adjusted after-tax incomes fell 8.7%, the largest quarterly decline since the record-keeping began in 1947!!!! Readers of this blog should not be surprised by this data as The Economic Cycle Research Institute, a New York-based independent forecasting group also known as ECRI, warned us right here on this blog earlier this year with the following articles as well as their regular "Weekly Leading Index" (WLI) updates that I cover in my newsletter and often report here. 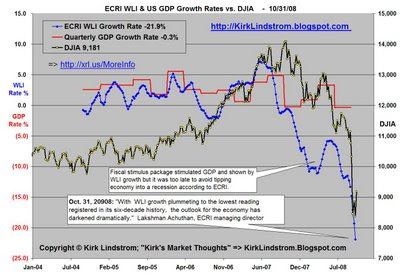 Saturday, January 05, 2008: "ECRI Says Fed Has Room To Cut Rates Despite Fears of Inflation"
"WLI growth is now at its worst reading since the 2001 recession. However, the WLI's recent decline is not based on pervasive weakness among its components, suggesting that a recession could still be averted"
Friday, January 25, 2008: "ECRI Says There Is A Window of Opportunity for the US Economy"
The U.S. economy is now in a clear window of vulnerability, given the plunge in ECRI’s Weekly Leading Index (WLI) since last spring. Yet there is a brief window of opportunity within that window of vulnerability to avert a recession. That is why ECRI has not yet forecast a recession. Congratulations to ECRI for correctly predicting a recession while the president and many others early this year were clearly saying the American economy was healthy. Subscribe TODAY and get the October 2008 issue FOR FREE! 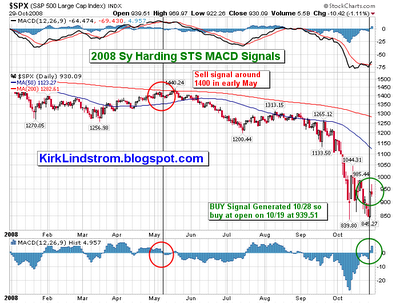 Yesterday the MACD for the S&P500 turned positive for a Sy Harding Buy Signal. (See Sy Harding: Seasonal Timing Strategy.) The MACD is the "special sauce" that Sy Harding applies to his variation of the "Seasons in the Sun Strategy" which he calls his "Seasonal Timing Strategy" or STS for short. STS worked great this year getting out of the market in the Spring around 1400 and getting back in now at about 939, 33% lower! If the market recovers to 1400, Harding's STS will have made an incredible 49% more than buy and hold! Sy will use the same indicator to look for the favorable exit point from the market when the MACD gives a sell signal any time after April 20. What is the formula for MACD? MACD as we use it is plotted as follows: Using the daily closing prices of the index or security you want to plot MACD on, subtract the value of a 26 day exponential moving average of the closes, from a 12 day exponential moving average of the closes. That produces the solid indicator line. Then plot a 9 day exponential m.a. of the indicator line, and display it on top of the solid indicator line as a dotted or different color line, so you can tell the two apart. The dotted line is known as the signal line. When the solid line crosses the dotted line to the downside it produces a sell signal. When the solid line crosses the dotted line to the upside it produces a buy signal. If you use weekly data rather than daily data, or assuming you're doing this via computer, simply compress the daily data by a factor of 5, you will change the short term MACD indicator to an intermediate term MACD indicator. Only the short term version is usable with the Seasonal Timing System. I back tested my formulas (I have an account at Stockcharts.com) with the charts Sy Harding shows for his STS for 1997 and 1998. The signals my formulas generated match Harding's published buy and sell points exactly. You can watch the weekly MACD here for free. Bottom line: Beware what you read on discussion forums. If people can't present the math or formulas to back what they are saying, then proceed with extreme caution! See Sy Harding: Seasonal Timing Strategy for more information. In this Oct. 24, 2008 Bloomberg interview, Jim Rogers predicts massive inflation is coming. We are going to have an inflation nightmare. Whenever people have printed a lot of money, six months to two years later, you have terrible inflation. People all over the world are printing money like mad. Jim says he is currently in short term treasuries but expects to get out soon and go short more government long term bonds. He also says commodities are still in a bull market, he has used this downturn to add to commodities, especially gold, and he expects to make the most money in agriculture in the years ahead. YouTub Video: Oct 24 Bloomberg Interview. Jim is buying commodities and Swiss Francs. Jim says we should abolish the US Federal Reserve and the guys on Wall Street with the fancy cars need to learn to drive tractors and the farmers in the years ahead will be buying the fancy cars. Jim also showed two gold coins he bought in Zurich. The woman interviewing him said individual investors are having a hard time getting gold coins to which Jim said that is often the sign of a top. "There has been a run on gold..... The public, the odd lotters, are sometimes the last ones in. Jim says Paulson, Bernanke and the "idiot at the NY Fed" are never right and making it worse because they are not letting people/banks fail. Jim thinks they could turn this into another depression. Jim brought up what happened in Japan and blamed it on not letting banks fail in Japan. Jim, didn't Japan have massive deflation during that period where they let banks mark assets to market to show they failed? Jim says "propping people up has never worked in the history of the World." Jim says the competent people should be taking market share from the incompetent, but we are seeing the reverse due to government interaction. Banks that make bad loans are getting more money from the governments to make more bad loans rather than let them fail. Jim says the inventory of food is the lowest in 50 years. There is a shortage of farmers, tractors, tractor tires, seeds, etc.. Too many stockbrokers, journalists and investment bankers. 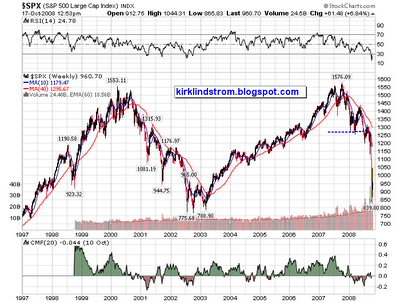 Jim says the bottom in equities will come when the market goes up on bad news. "those of us who have looked to the self-interest of lending institutions to protect shareholder's equity (myself especially) are in a state of shocked disbelief. Such counterparty surveillance is a central pillar of our financial markets’ state of balance. If it fails, as occurred this year, market stability is undermined." It is hard to believe the Fed chairman was that clueless. Did Greenspan not learn anything from Enron, WorldCon and the accounting firms that signed off on the books of such good clients? Did Greenspan not learn anything all the internet IPOs of worthless companies with no profits where insiders kept selling shares all the way up and all the way down while leaving "clueless" 401K type shareholders and index funds who had to buy holding the bag? "In 2005, I raised concerns that the protracted period of underpricing of risk, if history was any guide, would have dire consequences. " Reminds me of tobacco companies putting labels on their death sticks saying "smoking can kill you." "This crisis, however, has turned out to be much broader than anything I could have imagined." Yes Al. The people we paid and TRUSTED you to REGULATE found a way to sneak their "worthless" or at least "harmful products" by YOU so they could generate high fees and vanish before the stuff hit the fan. Skip the fancy language Al and admit you screwed the pooch. "This crisis will pass, and America will reemerge with a far sounder financial system." Full text of Greenspan's prepared remarks. During the Q&A, Greenspan said he did not take out an adjustable mortgage because he thought it was too risky. I believe that is a lie or a misrepresentation of facts. I doubt he needed a mortgage with his high net worth AND I remember clearly him on TV recommending adjustable mortgages. Erin Burnett said the same thing on CNBC today. The world faces a huge oversupply of oil next year should production continue at current rates, OPEC's secretary general Abdullah al-Badri said on Tuesday, as his organization prepares for an emergency meeting to discuss output cuts. "If things stay as they are, there will be a huge excess of supply in 2009," Badri told a news conference a few hours after arriving in the Russian capital. Our good friend (HA HA) Badri also launched an attack on British Prime Minister Gordon Brown and unnamed officials in the United States for creating the global financial crisis, and said OPEC was powerless to stop its effects around the world. "We don't have the ability to bail out the financial crisis created by Mr. Brown and others in the United States," he said. "Everybody will feel the heat one way or another of the financial crisis. The Chinese are the least likely to be affected." In a New York Times OpEd article today, Warren Buffett says he is moving from US Treasuries to US Stocks now. I pay attention to what Buffett has to say. Buffett wrote that his personal portfolio that was not in Berkshire Hathaway stock was in "nothing but United States government bonds" before this decision to buy stocks now. Be fearful when others are greedy, and be greedy when others are fearful. And most certainly, fear is now widespread, gripping even seasoned investors. To be sure, investors are right to be wary of highly leveraged entities or businesses in weak competitive positions. But fears regarding the long-term prosperity of the nation’s many sound companies make no sense. These businesses will indeed suffer earnings hiccups, as they always have. But most major companies will be setting new profit records 5, 10 and 20 years from now. I like what Buffett says about cash. I agree. On Monday I moved a good chunk of my core portfolio from Vanguard Money Funds to Vanguard's Treasury Inflation Protected Securities (TIPS) fund (VIPSX Charts) after I sent a chart to my newsletter subscribers showing TIPS were paying the highest base rate in years. I completely agree and have been buying this downturn myself. Some things I bought were the S&P500 exchange traded spiders fund (SPY Charts) at $87.54 on 10/10/08 and my very first shares ever of Google (GOOG Charts) at $310 yesterday. If you want to know what else I have been buying in this period of weakness with my profit taking dollars from selling when the market was higher, Subscribe to Kirk's Investment Newsletter TODAY and get the October 2008 issue FOR FREE! For full Buffett Article, see "Buy American. 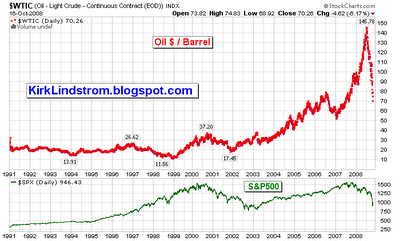 I Am"
Oil prices (charts) have fallen $75.52 or 52% since peaking in early July of this year. This chart from "Chart of the Day" puts the decline in perspective. When adjusted for inflation, oil prices are now lower than they were during the Iran crisis and just after Hurrican Katrina spikes. Some on TV say the spike in the price of oil was driven by speculators, but this chart shows the weak dollar was also responsible. Now that the global stock markets have melted down, investors around the World are seeking safe haven in short term US Treasury notes which is helping the dollar rally. It appears the weak dollar pushed oil prices to the low $100s. Then trend followers and clueless speculators pushed it higher, which is normal in a free market. 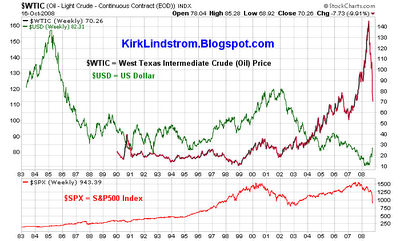 Charlie Maxwell Says $300 Oil Inevitable: Charlie predicts oil prices between $75 and $115 for awhile. After that, he sees prices soaring again. Charts of the International Securities Exchange (ISE) Sentiment Index plotted versus the Dow Jones Industrial Average (DJIA charts), S&P500 ( S&P500 Charts) and NASDAQ composite index (NASDAQ charts) are key sentiment indicators for stock market technical analysis. Contrarian theory states the time to buy is when fear and pessimism is at a maximum since this usually occurs near market bottoms. 10/11/08 Commentary: The 10 day moving average (DMA) of ISE Sentiment has turned up sharply and the 20 DMA is turning up yet the DOW has plunged, probably as mutual and hedge funds were forced to liquidate to meet redemptions after investors got quarterly statements and panicked. The dividend yield on the S&P500 is currently higher than the 2.76% available with the 5-year Treasury Note. I graph bond prices vs. the markets vs time. When you see not only stock investors but bond investors flee risky investment for the safety of short term Treasuries, then a loud gong goes off. The gong was very loud last week. Like Buffett, I have no idea if or when the eventual bottom will happen but I rebalanced when the market was higher to take profits in equities. [See "take profits" pdf.] Now that equities are much lower, I've been rebalancing again by buying equities to get to my target asset allocation. I use a TINY bit of market timing to help me rebalance when the gongs sound and my target "fat pitch" price levels for the securities on my shopping list are reached. I know full well that stock can go lower, but long term, I am betting on the USofA while collecting a nice dividend on the SPY (SPY Charts) I bought Friday at $87.54 for my personal core portfolio rebalance. Core and Explore Method: I recommend a "core" portfolio for about 80 to 95% of your funds and an "explore" portfolio made of stocks from my newsletter portfolio for the remainder. My newsletter stocks are volatile by design to add to overall returns, but you need a good core portfolio to sleep well at night. I offer several different core portfolios for both aggressive & conservative investors. My newsletter portfolios are ALL significantly ahead of where they started 2000 which I feel is quite an accomplishment given how well I did in 1998 and 1999. As of today, the S&P500 is well below its January 2000 level. 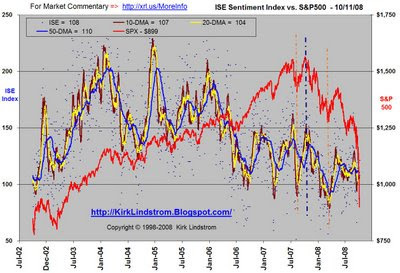 For a current reading on what the ISE sentiment index charts mean and many other sentiment indicators mean, subscribe today and get the October 2008 issue of Kirk Lindstrom's Investment Newsletter for FREE!. October 9 has marked several important turning points for the markets. 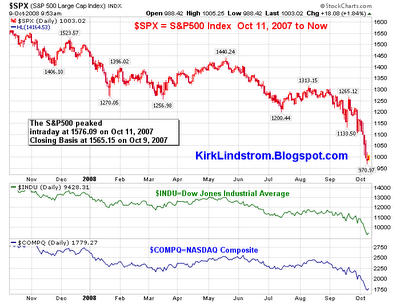 October 9, 2002 was the day the S&P500 (more charts) made its low for the 2000 to 2002 bear market. October 9, 2007 was the day the S&P500 peaked on a closing basis at 1,565.15. 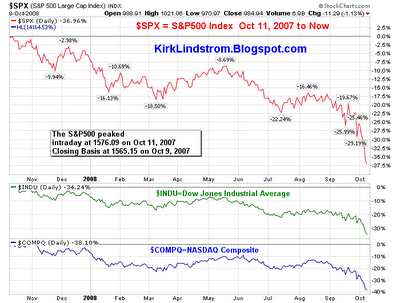 Could October 9, 2008 be another major turning point? The average bear market decline is about 30%. We are currently down 38%, 37% and 40% in the S&P500, DJIA (more DOW charts) and NASDAQ (more NASDAQ charts) composite since the peak. The odds favor buying now if you have a long-term perspective and confidence like I have that the US will somehow muddle its way through this mess as it has in the past. =>This means the decline from intraday high to intraday low is 38.4% and we are currently 37.5% off the peak. =>This means the decline from high to low has been 36.7% and we are currently 35.2% off the peak. =>This means the decline from intraday high to intraday low is 40.4% and we are currently 0.391814112 39.2% off the peak. If you want to know what I have been buying in this period of weakness with my profit taking dollars from selling when the market was higher, Subscribe to Kirk's Investment Newsletter TODAY and get the October 2008 Issue for FREE! Given the average bear market decline is about 30% and we're down 38%, 37% and 40% in the S&P500, DJIA and NASDAQ composite, the odds favor buying now if you have a long-term perspective. We could go lower or the bottom may be in. Major market turns have occurred in early Octobers of the past. I like the odds and have been buying. John (Jack) Bogle, founder of the Vanguard Group, was just on CNBC. He is famous for saying "stay the course" and don't try to time the stock markets which he repeated. When asked if people should sell equities if they are close to retirement and are worried about future losses he said yes if it is to raise cash to get to a target bond (fixed income) allocation. Jack said he likes "something like your age in bonds" and said he is 80 and has about 80% in bonds. In his 2007 book “The Little Book of Common Sense Investing” Vanguard founder John Bogle says your "serious money account" should be 50% to 100% in index funds. He says 5% of your assets can be in a "Funny Money" account. Here is some more advice from pages 202 & 203. Individual Stocks? Yes, Pick a few. Listen to the promoters. Listen to your broker or adviser. Listen to your neighbors. Heck, even listen to your brother-in-law. Exchange Traded Funds (ETFs)? Maybe. Buy the ones that hold the classic index portfolio with your serious money account. Invest but don't speculate. Commodity Funds? No. They don't have fundamentals like dividends or earnings to support them. Hedge Funds? No. "Too much hype... Too much cost and too little tax efficiency." Hedge funds-of-funds? "No. Really no." They are even more expensive than hedge funds! See my article "Insana Capital Partners Hedge Fund to Close." Asset Allocation: On pg 208 Bogle recommends "your age in bonds" or even "your age minus 10% in bonds." Thus someone 65 years old would have 55 to 65% of their investment assets in bonds. He admits this is conservative and below what most experts advise but he is a conservative person. Bogle vs. Kirk's Advice: I believe my advice is little different from Bogles advice. Bogle says you can have up to 50% of your portfolio in managed funds, up to 5% in a "Funny Money account" and the rest should be in index funds. He is clear he thinks the index funds will do the best overall and would be happy with 100% in index funds for both equities and bonds. I believe my "explore portfolio," if followed exactly, is no different than investing in a managed mutual fund but I only recommend it for 5 to 20% of your investment assets. My recommended core portfolios are 100% globally diversified index funds. I recommend my core portfolios for 80% to 95% of your investment assets. Appearing on CNN this AM, Terry Savage (Terry Savage Fan Club) was asked some investment questions. Rhonda wanted to know if she should leave her 401K alone or move her money and/or her percentage contributions to more stable bonds. Terry said if Ronda is still working and has 20 or more years to retirement, then she needs to keep contributing. Terry said 30% in company stock is a little too much so she should look to diversify. She also said bonds are risky if somewhere down the road inflation returns. Her allocation advice was to "stay balanced" with "more in stocks." I agree 100% with those good answers. Liz asked "I have an annuity with AIG.... is it safe? Should I take action?" Terry said the government put $85 billion behind AIG to prevent it from failing so she says you should not lose sleep over it but you should understand what you own and the risks associated with the investments in your annuity. You can get that information from your agent. Jane, a 19 year old college student, said she put a couple thousand dollars into the market last week. She wants to know if she should continue to do this if she doesn't need it for three years. Terry said three years may be too short a time period for money you need to be invested in stocks. A repeat of the 1970s could see the markets lower in three years even after the huge recent decline. Terry recommended a money market fund for money you know you will need in three years or less. Kirk Comment: This note came in an email from Terry Savage this AM. Few of today's investors remember the seventies. At the start of that decade, in 1972-74, the Dow fell from over 1,000 to below 600 in 18 months. Then the DJIA stayed below 800 until this bull market started in summer of 1982. In Japan in the 90's their stock market dropped similarly, and took a decade to rebound -- because their government refused to confront the problems in its financial system. The markets NEVER repeat exactly, but it's wise to learn from history. And history tells us that -- unlike recent experiences of quick declines and major rebounds -- it IS possible that the market could go down, and STAY down for a significant period of time. It's not about the markets -- it's about YOUR financial situation! It's about your age, risk tolerance,and ability to withstand a market decline, both in financial and emotional terms. It's time to think about your investments in a larger perspective, not just what the market will do in the next few hours. Kirk Comment: I remember the 1970s well. I entered UC Berkeley's college of engineering in 1975 about the same time my grandfather retired. He bought a lot of dividend paying stocks to fund his retirement. Sure the market went nowhere during that time but he and my grandmother lived well off those dividends including many trips all over the World. I've learned from this. My "explore portfolio" has a mixture of hopefully undiscovered explosive growth stocks and safer stocks paying good dividends. This diversification between growth and value gives me opportunities to rebalance for added return. (See Using Asset Allocation to make money in a Flat Market for how this works.) I buy both when out of favor with the idea both will continue to give me long term results that crush the market averages. Joe in Georgia asked if the DOW went up 777 points after going down 777 points does it mean he is back to even. Terry said this is true only if you own the DOW index. Other indexes with greater diversity may do better or worse. Terry added there has never been a 20 year period where stocks have not made money in a diversified portfolio of large company stocks so Joe should keep investing for the long-term. 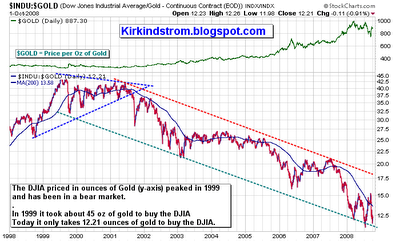 DOW Priced in Ounces of GOLD: A Secular Bear Market! Today it only takes 12.21 ounces of gold to buy the DOW! The good news is the DOW priced in gold just bounced off support with gold falling faster than stocks. The news about the markets could not get much worse so perhaps we'll get lucky and have a triple bottom for the DOW:Gold chart and see the market rally in anticipation of better times in 2009. Cutting interest rates to get the US out of the 2001 recession may have worked but the inflation in commodities and devaluation of the US dollar it caused has caused pain for the US consumer. This pain is often blamed on president Bush who took office just as the DOW/Gold ratio broke out of the "symmetrical triangle" pattern , shown above in blue and explained below.